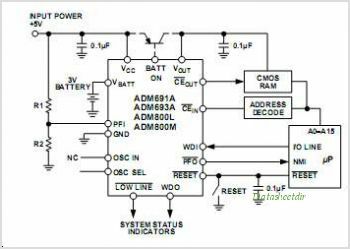 The ADM691A ADM693A ADM800L/ADM800M family of Supervisory Circuits offers complete single chip solutions for power supply monitoring and battery control functions in Microprocessor systems. These functions include mP reset, backup-battery switchover, watchdog Timer CMOS RAM write protection, and power-failure warning. The family of products provides an upgrade for the MAX691A 93A/800M family of products. Power-on reset output during power-up, power-down and brownout conditions. The circuitry remains operational with VCC as low as 1 V. Battery backup switching for CMOS RAM, CMOS micro-processor or other low power Logic A reset pulse if the optional watchdog Timer has not been toggled within a specified time. 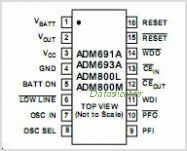 A 1.25 V threshold detector for power fail warning, low battery detection, or to monitor a power supply other than +5 V.
This is one package pinout of ADM800,If you need more pinouts please download ADM800's pdf datasheet. This is one application circuit of ADM800,If you need more circuits,please download ADM800's pdf datasheet.